This one is for the Ford and Mercury lovers. Jerry Harvey, wheeling the Quiet One II SOHC Mustang takes on Wayne Gapp in the Chargin’ Cyclone at Detroit Dragway’s 1967 Midwest Championships. I’ve discussed the Chargin’ Cyclone before, as Gapp ran the same car at the Detroit Invitational a year earlier. Gapp and the Hi-Risers returned in 1967 to again capture runner up honors in the gasoine funny car segment. His opponent this round is Jerry Harvey. According to Dearborn Flashback, a site that seems to be an authority on Ford Racing History, the Mustang was originally built for Len Richer. It was updated by Holmon and Moody and turned over to Harvey for the ’66 and ’67 racing seasons. Harvey collected the A/FX crown at the 1966 Winternationals in the ‘Stang, and ran the car through 1967. In later years, both Hubert Platt and Dyno Don Nicholson took turns running the Mustang at national events. A group of east coast racers then acquired it for street racing. According to the Dearbon Flashback article, the car still exists and has been restored to the ’66 configuration. Although not as radical as the Gray Ghost or the Stardust Charger, the Quiet One II is indeed an altered wheelbase funny car, with the rear wheels moved forward three inches. The original Mustang chassis was heavily modified to accommodate the big 427ci Ford cammer powerplant. Gapp moved on to a SOHC Mercury Cougar he called Top Cat Super Cat, then took possesion of Pete Gate’s Comet funny car. He draped the chassis with a fiberglass Mustang body and campaigned it as a gas funny car. Eventually, he teamed with Jack Roush to become a fearsome competitor in the early days of Pro Stock Eliminator. If you’re wondering about all the pylons and the twin Christmas trees, those are for four lane racing. 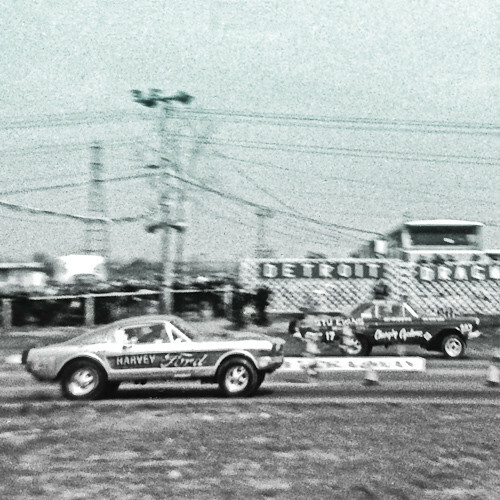 In 1967, Detroit Dragway ran the pro cars and match racers in two car matches, but most of the other categories went off as a four car matches. The top two cars advanced to the next round, while two cars went home. In those days, when inexpensive Muscle cars were available at any dealership, a huge amount of street driven entries turned up every Sunday. By running them four at a time, the track was able to complete the day’s racing in half the time. This entry was posted in 1967 and tagged Detroit Dragway, Funny Car, Hi-Risers, Jerry Harvey, motorsports, Mustang, Quiet One, racing history, SOHC, Wayne Gapp. Bookmark the permalink. Post a comment or leave a trackback: Trackback URL. Great article and cool pic. One small item is that the Cougar was called the ‘Super Cat’. Thanks for pointing out the error about the Cougar’ name. I knew it was Super Cat, but when I wrote the article I had a brain fade and wrote Top Cat. I’ve corrected it in the article.